Jussie Smollett, the openly gay star of Empire, has been the victim of a horrific hate crime after being attacked in downtown Chicago. According to police, Smollett, 36, was in the city to film the show when he went for a meal at a Subway restaurant sometime after midnight on Tuesday. As he walked to his apartment, he was accosted in the street by two men who started shouting homophobic and racist slurs at him. Smollett told police that he was beaten in the face and had an unknown substance, possibly bleach, thrown onto him. The men also put a rope around his neck before fleeing the scene. Smollett didn’t report the attack immediately, but his manager called police at 2:42 a.m. and the actor was taken to hospital for treatment for lacerations on his face and neck. He was later released. The attackers were reportedly wearing ski masks and Smollett told police that they yelled “this is MAGA [make America great again] country,” a slogan popularised by Donald Trump during his election campaign. The Chicago Police Department confirmed that it is treating the incident as a “possible hate crime”. The FBI have now also stepped in to investigate a threatening letter received by Smollett on 22 January that could be connected to the attack. It’s been reported that the letter states, “You will die black f*g,” and included a white powdery substance. The substance was found to not be dangerous. Empire creator Lee Daniels was among a host of celebrities who spoke out on social media in support of Smollett. “You didn’t deserve, nor anyone deserves, to have a noose put around your neck, to have bleach thrown on you, to be called die f*ggot n*gger or whatever they said to you,” he said. “Hold your head up Jussie. I’m with you. I’ll be there in a minute, because it’s just another f*cking day in America,” he added. LGBTQ media group GLAAD said it had reached out to Smollett’s team to offer him assistance. “Jussie is a true champion for LGBTQ people and is beloved by the community and allies around the world,” it commented. 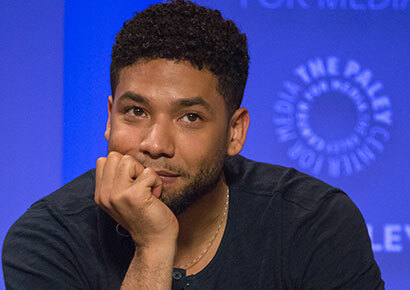 Smollett, who plays Jamal Lyon, the gay son of entertainment giant Lucious in Empire, came out to the public in March, 2015 on the Ellen DeGeneres show. “There’s never been a closet that I’ve been in. I don’t own a closet, I own a dresser,” he said at time. We got this @jussiesmollett ?????????? I can’t believe we still live in a country where hate is so severe. My heart, love and healing thoughts go out to @JussieSmollett. I’m with you, my friend.